The new K30L2 and K50L2 RGB Indicator Lights from Banner Engineering feature seven colors from just three inputs in one device. Due to a rugged IP69K construction that withstands impact and washdown, they're able to perform reliably in any environment. Their clear and uncomplicated wiring allows for a quick installation and allows for users to consolidate controller outputs. 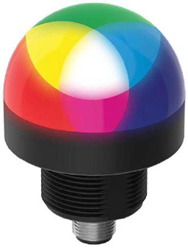 IO-Link enables vast custom indication possibilities for K50L2 LED Indicators.